Several important issues should be considered when searching for a retail shop to rent in Blackburn. First of all, you should consider the amount of floor space you will require from your shop. And if you can find a retail store or shop to rent in Blackburn which is in the perfect location then you will be onto a winner. But whatever questions concern you most, you will find the retail property to rent in Blackburn you're looking for at MOVEHUT. Here at MOVEHUT our aim is to make your search for a shop to rent in Blackburn run as smoothly as possible. We are confident in our functionality and our location based search feature, which will your search in Blackburn easier. So check out the great listings at MOVEHUT, and your search for a commercial shop to rent in Blackburn could soon be producing the right results. Having an adequate insurance policy is critical when you rent a shop in Blackburn. It doesn't matter if your shop is a clothing, fashion or furnishings store, you will be able to find insurance to cover all of the above. Insurers will tailor cover to make sure you get what you need for your business. Begin your search for a retail commercial property to rent in Blackburn with MOVEHUT and don't forget about your insurance. Let MOVEHUT help you find the ideal property in Blackburn to let. Here at MOVEHUT, we have shop in Blackburn at rental prices to suit all budgets, whether it's £8,500 to £215,000 pa. We want to help you find a shop that matches both your needs and your budget to rent, so search MOVEHUT's extensive listings to take the pain out of your property search. 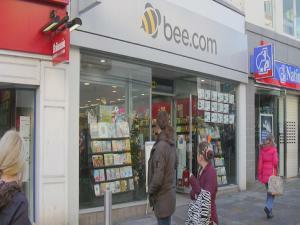 When you have found a shop to rent in Blackburn you will no doubt want to place an offer. The price is important, but is definitely not the only factor that should be taken into account when your offer to rent the shop is given, as the landlord may be swayed by a lower offer if you can guarantee a completed transaction in a short time frame. At MOVEHUT it's our aim to help you find the perfect commercial property to let and we love it when we see negotiations concluded satisfactorily. If you're on the hunt for a shop in Blackburn, then you might have a few requirements that need to be satisfied. Your shop location in Blackburn should be a primary consideration, and you will probably want to make sure there is ample parking space onsite or nearby. So once you have decided which factors matter most to you, start your search for a shop for rent in Blackburn with MOVEHUT and you'll soon find the one that's right for you.